Dr Shailesh Nayak, Chancellor, TERI SAS Dr. SHAILESH NAYAK (born August 21, 1953), a PhD in Geology from M. S. University of Baroda (1980) is a versatile person with a distinguished career and proven track record of 29 years at Indian Space Research Organisation(1977-2006) and Indian National Centre for Ocean Information Services (May, 2006-August, 2008). 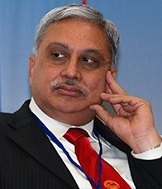 He is a former Secretary of Ministry of Earth Sciences, Indian Government between August 2008 and August 2015. He served as the interim Chairman of ISRO between 31 December 2014 and 11 January 2015. He was awarded the National Mineral Award for the year 2005 and the Indian National Remote Sensing Award for the year 1994. He is recognized as Ph.D. Guide by five universities and currently five students are carrying out research under his guidance. He was Member of the editorial board of the Indian Journal of Marine Science and currently one of the editors of Geospatial Today. He is the President, Indian Society of Remote Sensing, Dehradun. He was the President, International Society of Photogrammetric and Remote Sensing (ISPRS), Technical Commission (TC) IV on ‘Geo-databases and Digital Mapping’ for the term 2004-08. He has represented ISRO at the International Ocean Colour Coordinating Group and International Global Observation Strategy-Coastal theme. He has published about 70 papers in International and National journals and atlases. Message from ChancellorThe greatest challenge of the century is to ensure economic development to eradicate poverty while protecting the environment. We need to find innovative solutions to sustain such development and improve quality of life. There is a need to link the dynamics and interactions of the Earth system with the social system or governance structure, industries, infrastructure and human system or citizen response and awareness to address sustainable development. We have to integrate knowledge from science and technology as well as social science and humanities. Such multidisciplinary approach is no more a romantic idea but a sheer necessity. The success of such integrated approach depends on consciousness of people. In this regard, TERI-SAS, has created an unique education system to produce scientists and managers needed to implement such a approach. The role of education and capacity building is very critical to improve our knowledge of sustainability science. The Institute has provided an environment where young and creative minds, open to new ideas, interact across disciplines and institutions. It has been successful to bring together expertise on natural and social sciences, engineering at global, regional and local perspectives. I am sure TERI-SAS will become a net producer and exporter of knowledge on sustainability. I wish all success to TERI-SAS family in this endeavor.